4 Estrellas has just returned from a trip to the Florida Keys February 2018. All systems ready to go, new engine start battery, new Raymarine autopilot 2018. The Jeanneau 49DS is a modern hull shape created by Phillipe Briand. The four cabin/four head version includes four double berths and a salon table that converts to a double berth. The cockpit has a cockpit table, tan bimini, and dodger. Twin steering wheels provide the perfect vantage point for helm control and give easy access to the sugar-scooped stern. Designed to stand up to all that the sea can deliver, this impressive sailboat represents the harmonious balance between performance, comfort, and elegance. She features fine entry lines, a responsive and quick hull, and an unencumbered deck layout. 4 Estrellas features a Kevlar reinforced hull for superior integrity offshore. The cat-eye window on the rounded deckhouse grabs your attention—it’s distinctly Mediterranean. Whether you know of him or not, it’s hardly a surprise to learn that the designer’s name is Vittorio Garroni, a name as European as the look. Combined with Garroni’s stylistic input is a hull and deck plan from Phillipe Briand, architect of French America’s Cup entries and Mari-Cha IV, and an interior designed by Jeanneau’s in-house team. Below deck, it is the volume that really stands out. Most visitors comment immediately on how light and open the saloon is. Upon descending the companionway ladder the forward facing navigation table is immediately to port. A nice curved seat keeps the navigator in place at sea. There is plenty of surface area on the table for a folded paper chart. The breaker panel is outboard of the table, and, as a reminder of where the boat is built, the labels are in both French and English. The saloon is a step down and it is spacious and bright as the name Deck Saloon suggests. 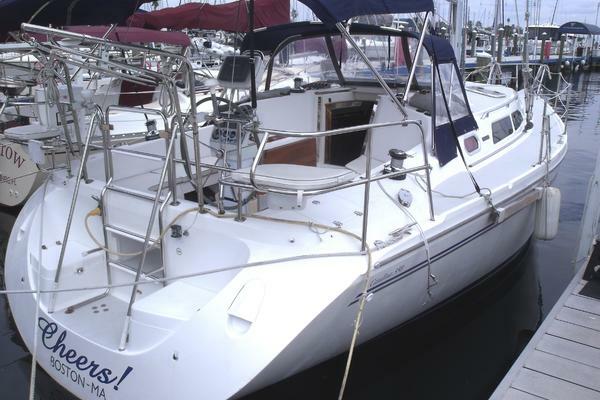 There is plenty of headroom and the various hatches, ports and windows let in lots of light. The saloon is wider than it is long and it is designed for relaxing and entertaining To starboard is a U-shaped settee, double bench, and table. To port is a smaller settee. The galley is immediately to starboard of the companionway and a small step down from the main cabin sole. The large, well lit galley features a gimbaled stove and oven, top and side opening refrigerator, microwave, and twin sinks. There is a well-placed eight inch high Lexan splash guard between the sinks and the saloon. The maximum beam of 14 feet, 8 inches is carried well aft, so the long cockpit is also quite wide, and feels roomy. It’s easy to imagine a division at the twin helms with plenty of space aft for kids to use the swim platform and deck shower, while adults relax at the cockpit table enjoying their lunch. The table base is made of molded fiberglass and fixed to the cockpit sole. The anchor windlass and a huge chain locker allow for the use of some beefy ground tackle. The deck-stepped mast stands 64 feet above the waterline and is supported below deck by a polished pipe strut that is bolted to the hull (hand-laid solid glass, while the deck is balsa-cored). The in-mast roller furling main doesn’t allow for mast bend or active backstay adjustment, but there is considerable rake, which explains the 9/10-fractional headstay. The roller furling system is made by Profurl.